AP/ TS Inter 1st & 2nd year Hall Tickets 2018 : Telangana Inter Board and AP Intermediate Board scheduled Intermediate 1st and 2nd year examinations from 28th February 2018 and also Conducted the practical examinations in January/February months. Hence students those who are pursuing under TSBIE, AP Inter can download Ap inter 1st year hall tickets, AP Inter 2nd year Hall Tickets, Ts Inter 1st year Hall Tickets, TS Inter 2nd year Hall Tickets By Name wise to proceed forward for the theory and practical examinations. Students without hall tickets are not allowed to proceed for the examination. The strict hall ticket checking will be done before the examination starts. Hence to project the hall ticket at the time of verification, all the students are advised to download and preserve the hall tickets in a safe place. Candidates can download AP Intermediate Hall Tickets & TS Intermediate Hall Tickets 2018 From below given Links. Andhra Pradesh (AP) Inter Exam hall Tickets and Telangana Inter Hall Tickets 2018 Downloading is compulsory to check exam centers and name mistakes and etc. Various Government/Private/Aided schools and colleges in the state of Telangana are associated to this board. The board organizes Jr. Inter and Sr. Inter examinations in time and releases the results in scheduled dates. This year the TSBIE board has decided to conduct the TS Inter second year examinations From February. This year more than 6 lakh aspirants are going to appear for the Intermediate 2nd year examinations in the state of Telangana. All the students of Maths/Arts/Science groups those who are appearing for Intermediate examinations can get ready for the exams by downloading the TS Inter Hall Ticket 2018 by following the steps given below. The TS Inter Hall tickets 2018 and Ap inter hall tickets accessible download on TSBIE official portal, Tsbie.cgg.gov.in, jnanabhumi.ap.gov.in respectively. Hence all the students belong to various groups Bi.P.C, M.PC., C.E.C, H.E.C and other groups can visit the website and download their corresponding hall tickets. After downloading the hall ticket, students can check the details of their examination centre, timings, and other details such as candidate’s name, hall ticket, father’s name/mother’s name, Date of birth and other details will be printed on it. Hopefuls attending for TS Intermediate examinations can download the TS Sr jr Inter hall tickets and ap junior senior intermediate hall tickets from below. 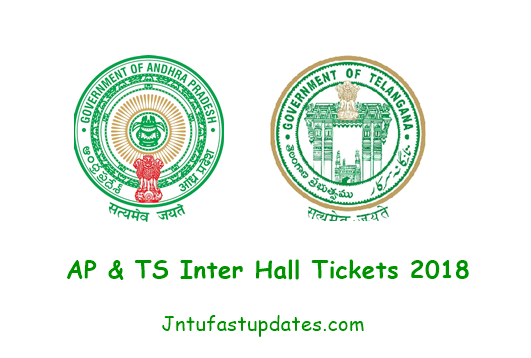 Steps to Download AP Intermediate Hall Tickets 2018 & Telangana Inter Hall Tickets Online? The TS Inter Hall ticket 2018 will gets downloaded. Preserve the hardcopy of hall ticket in a safe place to carry it while going to the exam. Inter 1st year Hall ticket. Sir when will the intermediate hall tickets will be available? Please give a reply sir..